We're going to Lake Placid for our annual cottaging and camping trip. 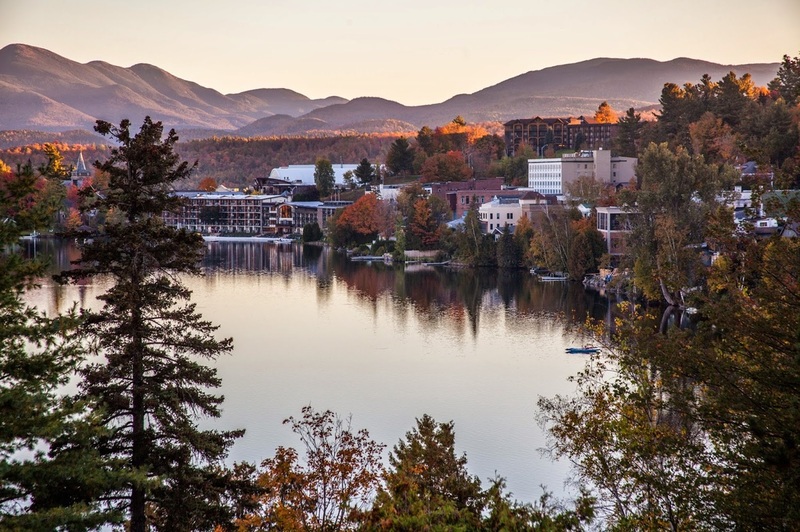 One of the most spectacularly beautiful places in upstate New York, Lake Placid, this weekend will have something for everyone. If you seek peace and quiet, our campground has hiking trails and a river running right through it. 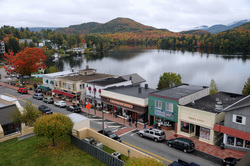 We are a 10 minute drive from the village of Lake Placid itself. Whether your preference is to relax and do nothing or do something extreme, Lake Placid has both options and everything in between. Relax on the nearby sandy beach or take in a leisurely boat cruise on Mirror Lake. 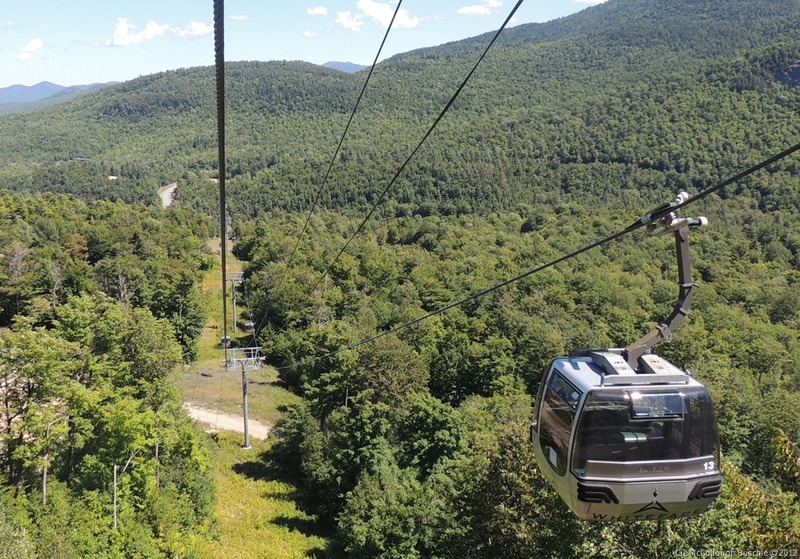 You could also consider taking the gondola to the top of Whiteface Mountain or, for the even more daring, coming down the Olympic bobsled run on special bobsleds equipped with wheels travelling at over 160 km/hour. Yikes!! Our campground has all of the necessary modern amenities including clean bathrooms and toilets, hot running water and showers, electricity at our tent site, a cafeteria and convenience store and even campground wide WiFi so you can remain connected with your phones, tablets and laptops. The basic tour package includes tent site space. You must bring your own tent. Tent rental is available for a nominal charge if you do not have a tent and don't wish to buy one. If you prefer not to stay in a tent, you can upgrade to a rustic cabin which has bunk beds or upgrade even more to a cottage which includes beds, a bathroom, a kitchen, electricity and even a TV. More details are provided below. Your tour price also includes a hot breakfast on both mornings and our group's Saturday evening BBQ. You will have to make your own arrangements for Friday evening dinner and lunch on all three days. As mentioned, a cafe and a convenience store is available at the campground and there are two nice restaurants within a short walk of the campground. We leave the Toronto area on Friday morning at approximately 8:00 AM and return to Toronto on Sunday night at approximately 10:00 PM. Actual pickup and drop-of times vary by pickup location. $349 per person. All taxes included. We have 5 pickup locations for this tour. We leave the Toronto area at approximately 8:00 AM on Friday morning. Actual pickup times vary by stop and will be sent out in the final email to all registered attendees, 2 days before the trip. We return to the Toronto area on Sunday night at approximately 10:00 PM. If you are denied entry to the US, sadly we will have to leave you at the border and pick you up on our return if you wish. Sorry but no refunds if you are denied entry. Local transportation on our bus to and from Lake Placid and the various Olympic venues while we are in the Lake Placid area. Admission to the private campground and tenting fee. Access to all amenities at the campground including use of bathrooms, showers, heated inground pool, laundry room, camp activities etc. Unlimited free Wi-Fi in select areas of the campground. Hot breakfast on both Saturday and Sunday morning. Group BBQ dinner on Saturday evening. Coffee, tea & bottled water all weekend long. Assorted snacks and munchies, cups, plates, water & ice. Lake Placid was the site of the 1932 and 1980 Winter Olympics and many of the facilities created for the Olympics are available to visit and experience. The village of Lake Placid, perched on the edge of Mirror Lake, is a beautiful mountain retreat very reminiscent of mountain towns in the Alps in Europe. Small shops, restaurants, bars, boutiques etc, line the main street and it makes for a perfect place to sit on a patio, sip your drink and watch the world go by. The Olympic museum is also right on Main Street and available for visits. You can ride the gondola to the top of Whiteface Mountain for some stunning views of the Adirondacks, the mountain range that you will be in. If you feel up to it, you can even climb up to the summit on one of the peaks but we warn you, it's a difficult hike and climb. 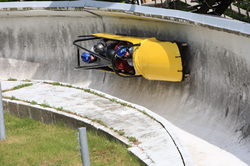 For the real adventurers, you can try the bobsled run. These are Olympic bobsleds that have been modified by removing their ice runners and replacing them with wheels. An experience driver goes down with you and does the driving so you don't go flying off the track but the sheer feeling of thundering down the side of the mountain on a concrete track, at speeds reaching 100 miles/hour (160 km/hour).... well, the adrenalin junkies in you will probably appreciate this ride. The village of Lake Placid sits on Mirror Lake which on calm summer days actually is so smooth that it looks like a flat mirror... thus the name. 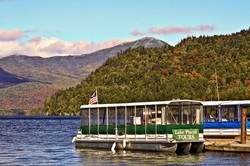 Boat cruises are offered on Mirror Lake throughout the day. You can take a tour of the ski jumping complex and ride the elevator to the top. 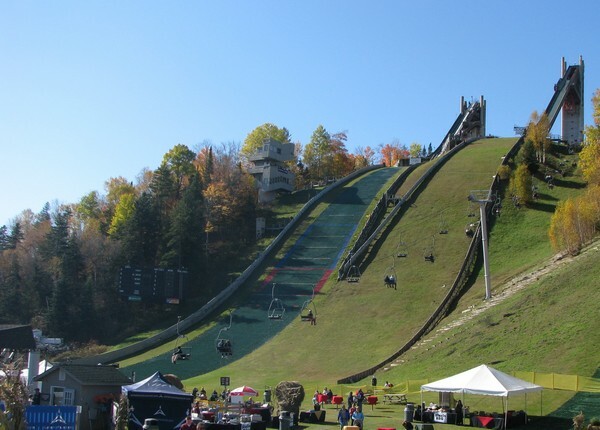 Alas, our trip is in July so there won't be any snow but at least it will give you of the frightening view that ski jumpers face when they are standing at the top of the jump. We will be staying at the Lake Placid KOA campground. The campground is nestled among tall pines and white birches and bordered by the Ausable River. The campground was the recipient of the KOA 2014 Founder's Award and President's Award for its range of activities, its cleanliness and the reviews from past guests. It has all the amenities that one could ask for from a campground and the staff are wonderfully warm and accommodating. Here are your options for accommodations. Please note that there is limited supply of cabins and cottages and they will be allocated on a first-come-first-served basis. Stay in your own tent. No extra charge, included in standard tour price. Rent a tent and air mattress. +$40 for the weekend. A rustic cabin is basic and does not have any amenities but you do have an option of either a double bed or a bunk bed. Bed linens are NOT provided! You need to bring your own bed sheets, pillow and sleeping bag, comforter or blanket. You will be sharing the cabin with 3-4 other people, depending on the size of the cabin. Bunk Bed. +$40 for the weekend. Double Bed. +$80 for the weekend. A deluxe cottage is a super sized cabin and has its own bathroom with shower, a kitchen, a small living area, a deck, electricity and TV. You will be sharing the cottage with 6-8 other people, depending on the size of the cottage. Bed linens are provided. You will need to bring your own pillow. Bunk Bed +$60 for the weekend. Pull out double sized sofa bed. The sofa bed is in the living room area and will need to be folded up during the day to allow the cabin guests to use it as a sofa. +$80 for the weekend. Private room with standard double bed. +$150 for the weekend.